ForgeWorld Warlord Titan has arrived! Saevus Ultio! | 30mm Madness! ForgeWorld Warlord Titan has arrived! Saevus Ultio! For my 40th birthday gift to my self, I purchased a ForgeWorld Warlord Titan. Titan #00065 has arrived! (or 1000001 in binary). Saevus Ultio (Fierce Vengeance) will be joining Saevus Verum, Saevus Rex, and Saevus Juris of Legio Invictus. The Warlord body (everything except for the weapons) is made up of 171 parts. That compares to 214 parts on the Reaver. Between the lower part count, the clean casts, and the lack of any interior detail to paint, I expect the build portion to take significantly less time the the Reaver. The casts are much cleaner, and I ran into zero (so far) parts that will need replacing or even moderate reshaping. I’m not sure if that’s due to the low cast number (65 instead of 1108) or if ForgeWorld switched to a CAD/3D printing design process (guessing), or both. 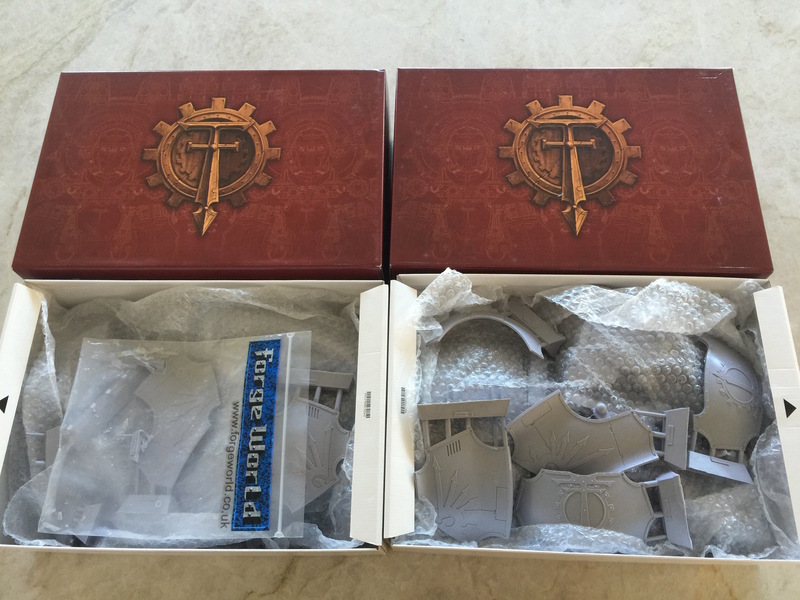 The reason I strongly suspect CAD is the instructions, which have beautiful and obviously rendered 3D representations of each piece, as opposed to photographed pieces seen in earlier ForgeWorld kits. This entry was posted on July 25, 2015 by justinhardin. It was filed under Legio Titanicus, Warhammer 40K . Titans are looking great. Love seeing a good Ol’ maniple :) Not sure if you have heard of Titan Owners Club yet. It’s a place which has been set up to catalogue all official certificated Titans in one place (from around the world), with the aim of building a community and base from which Titan battle events can be orchestrated.